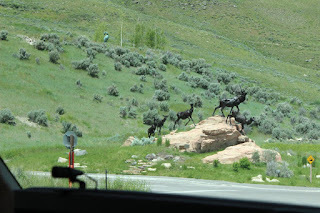 Coming out of the Sawtooth Mountains past Ketchum, Idaho, we follow Route 75 south to Route 20 and then east towards Craters of the Moon . 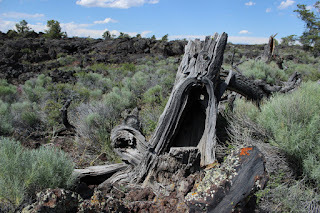 It certainly is a strange thing to come across this lava field in the middle of the high desert. 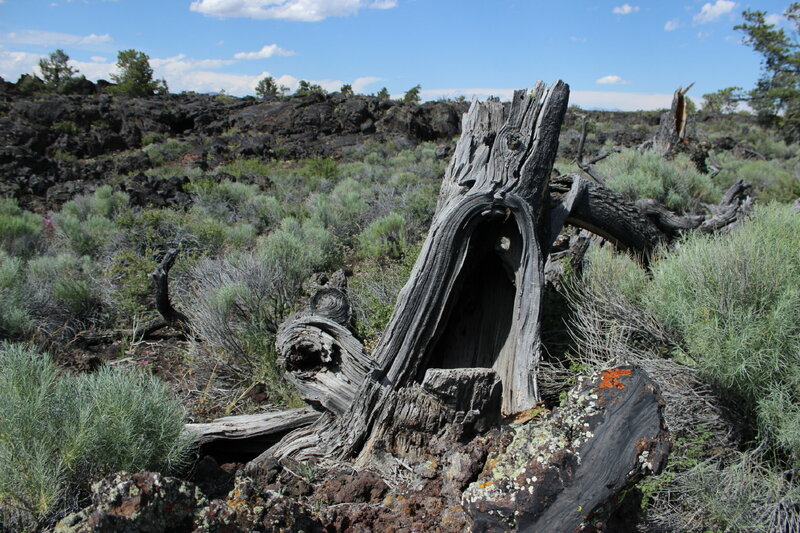 Suddenly you see a large area of hardened piles of lava, thousands of years old, that look like they had just cooled off. 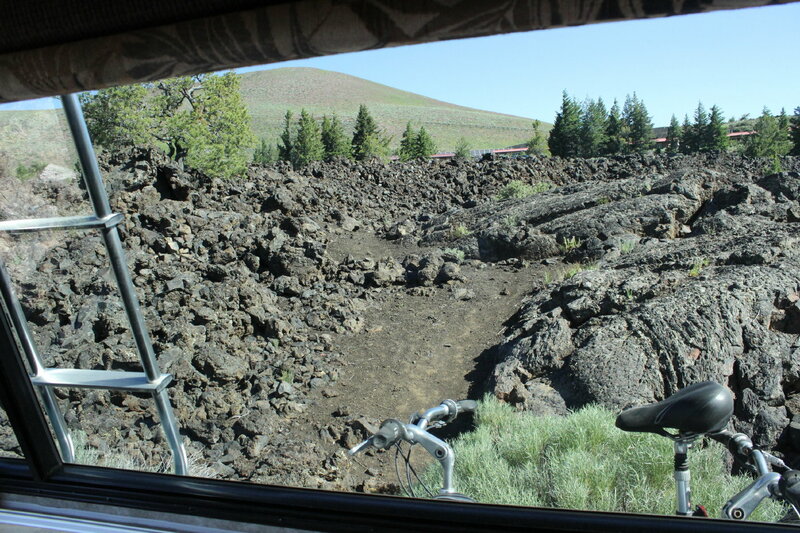 The top picture is a view from Lady Blue's back window at our campsite. 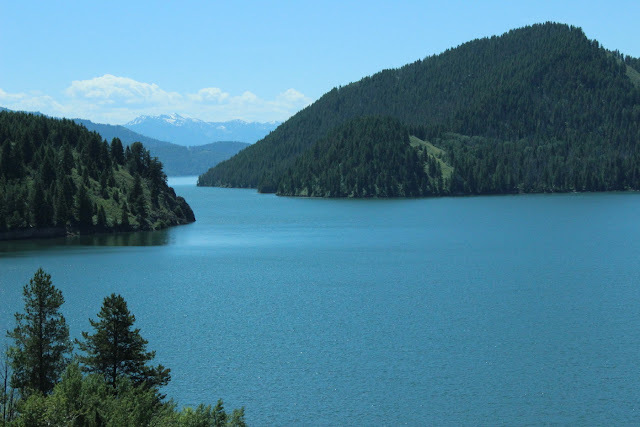 A little different from Redfish Lake and others? 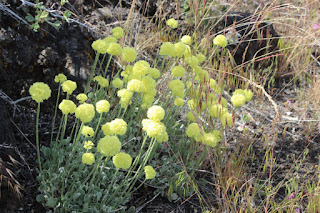 Around the preserve are some very colorful ground flowers, these dead limber pines, and colorful lichen on the rocks. 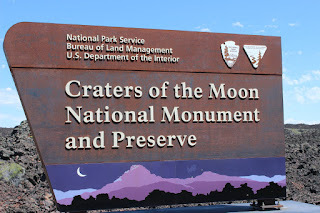 After Craters of the Moon , we head east on Route 20 and 26 towards Arco and Idaho Falls. 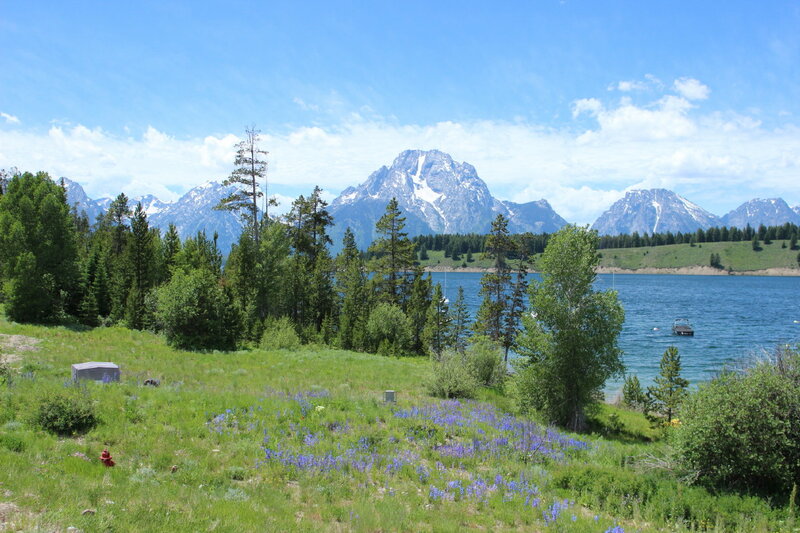 We are now following the Snake River again north towards its headwaters in the upper Tetons. 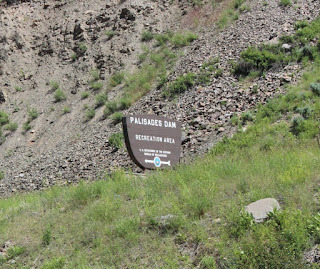 Just before the border we happen upon Calamity Campground in the Targhee National Forest, just below the Palisades dam. A lot of fishermen below the dam, as well as boaters and rafters. 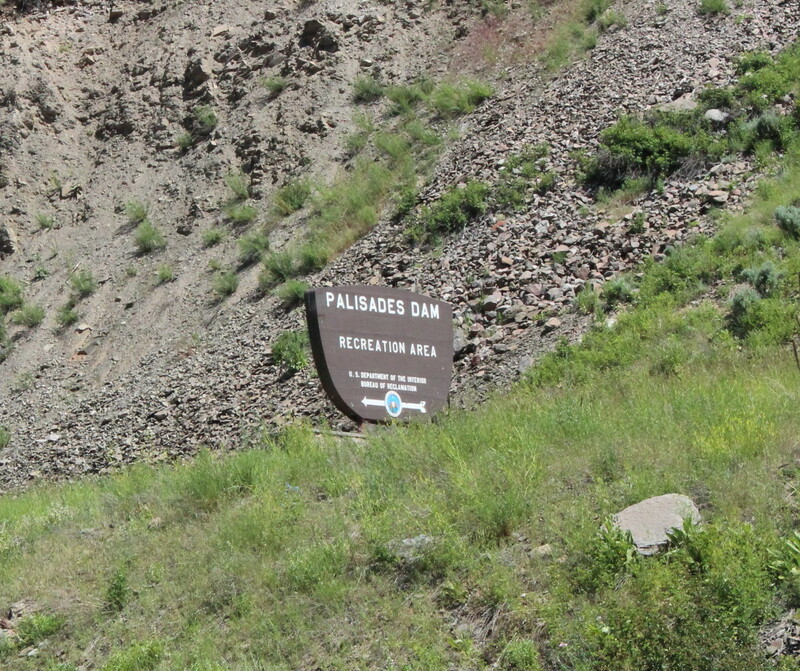 Above the dam is the Palisades Reservoir that goes on and on and on. A very pretty ride. 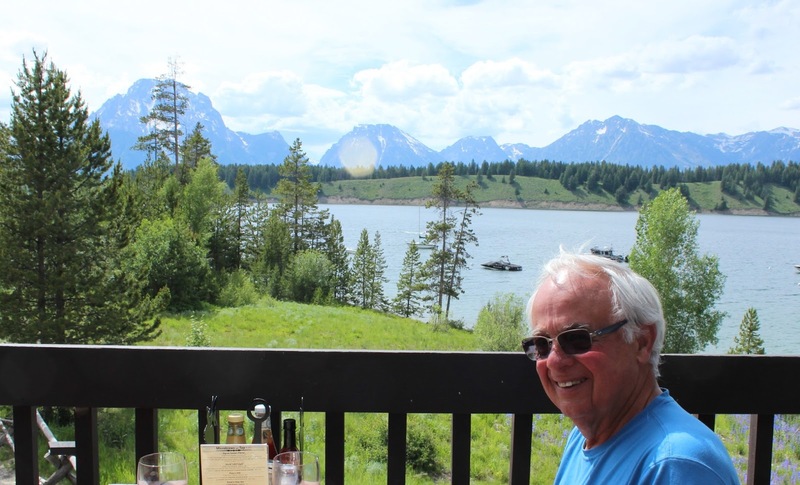 In the distance you see some of the Teton range in Wyoming. 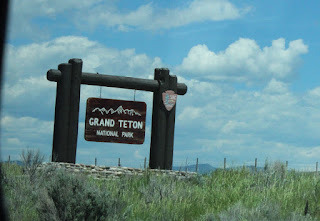 Jan and I follow Route 26 into Wyoming, joining Route 89 and then 191 into Jackson, Wyoming. Along the way are some great views of the Snake River with a number of rafters. Jackson is very busy tourist town. 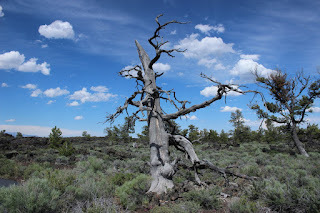 On a quiet day, we might like to mosey, but we prefer a quieter environment, so we head right through to Gros Ventre campground in the national park. We love this park and we prefer Gros Ventre as a campground, though there are a number of other campgrounds here. From our best site( number 69), Jan and I get the bicycles tuned up and head out to Kelly on Gros Ventre Road. We figure 8 miles is more than enough for a first ride in a while. 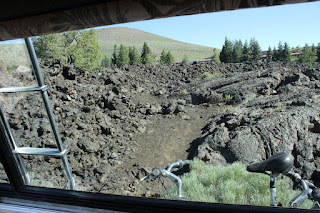 That bottom panorama picture is from our ride. Oh, and that picture of those two strange people!! 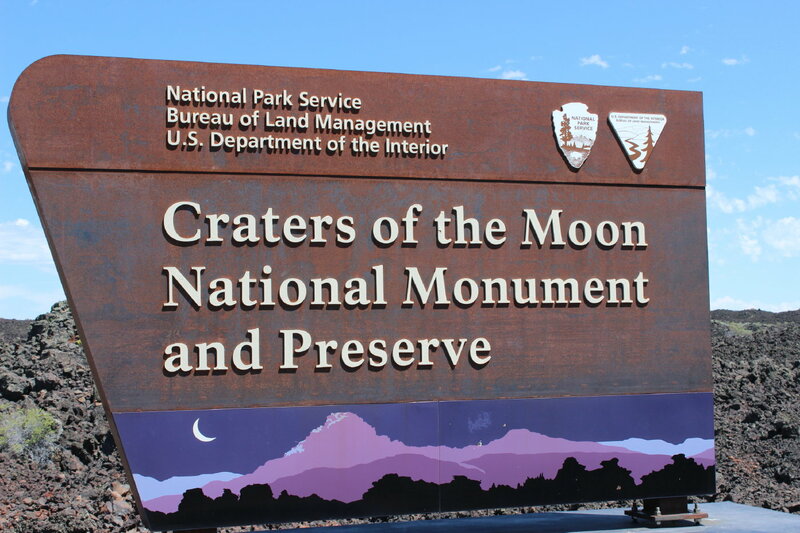 The next day, we drive Lady Blue over to the visitor's center, which is about 11 miles from our site. 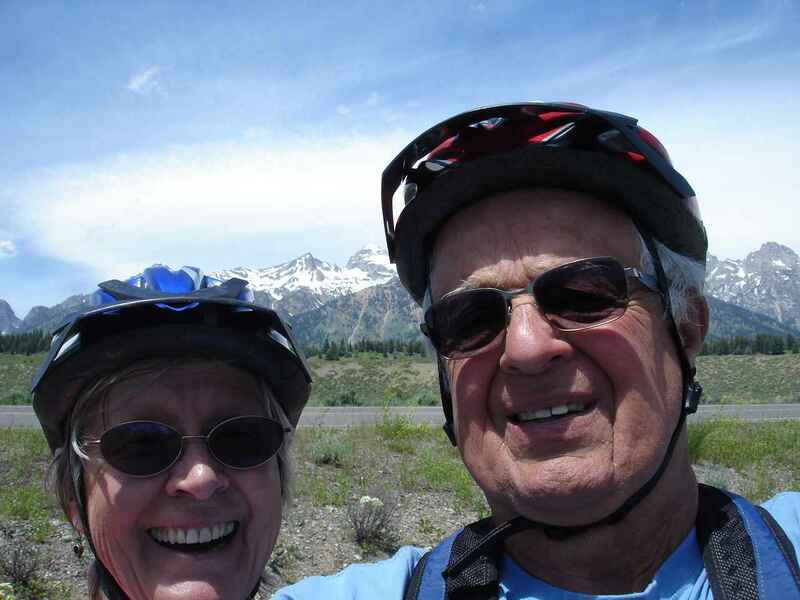 From there, we can leave Lady Blue and take the bicycles up to Jenny Lake---about 7.5 miles. There are some beautiful views of the mountains along the way. After a total of about 16 miles--pretty good for us--we bike to Dornan's which is close to the visitor's center. The bottom picture is from our seats at the bar where we had a glass of wine and shared a very good pizza while looking at this view!! Afterwards, we visited Dornan's store and picked up some great looking Wyoming steaks for a Father's Day dinner. 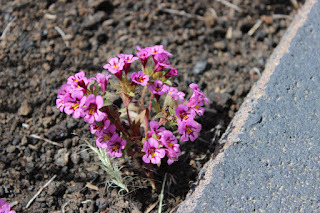 It helped that the bike trip back to Lady Blue was downhill! 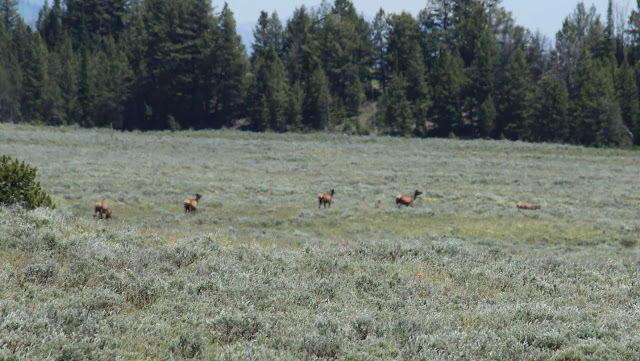 If you would like to see more pictures from Gros Ventre and Tetons, go to the right and click on 2013, then June. You will see 2 Grand Teton postings as well as postings from Yellowstone Park. Two years ago there were a number of bison here. This year they are nowhere around. Some of the hosts thought that with the rainy spring they have stayed longer up in the hills. 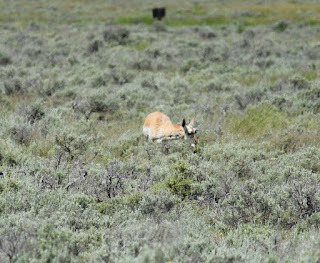 On our rides through the park this year, we do see a number of pronghorn. A better picture is the top one. 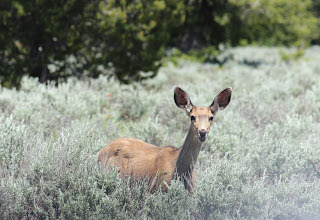 The middle picture is of a mule deer. 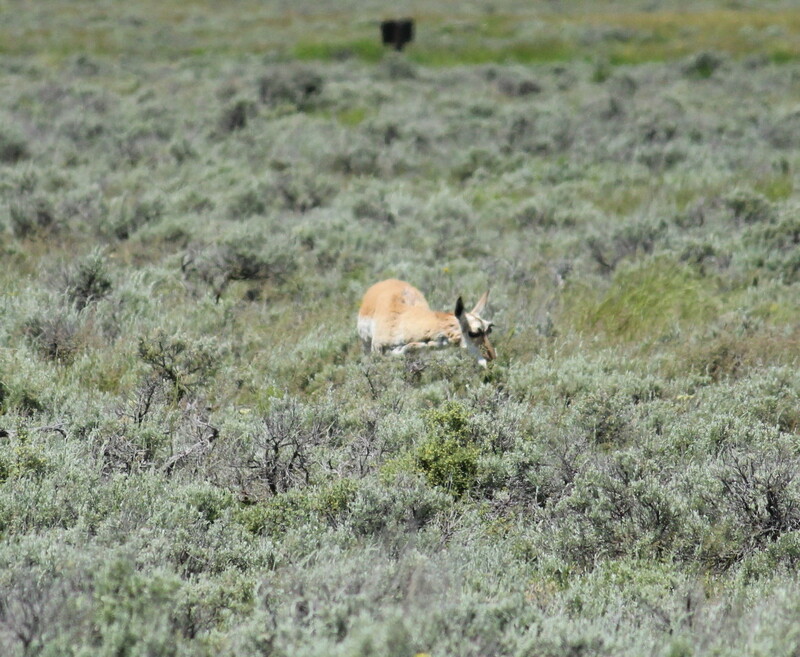 The pronghorn is the second fastest mammal in the world. Quite often it is a case of now you see them, now you don't. 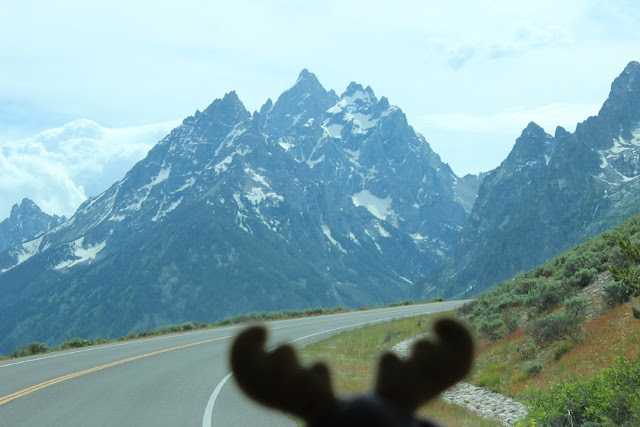 The last day of visiting inside the park, we drive Lady Blue up the Teton Park Road. 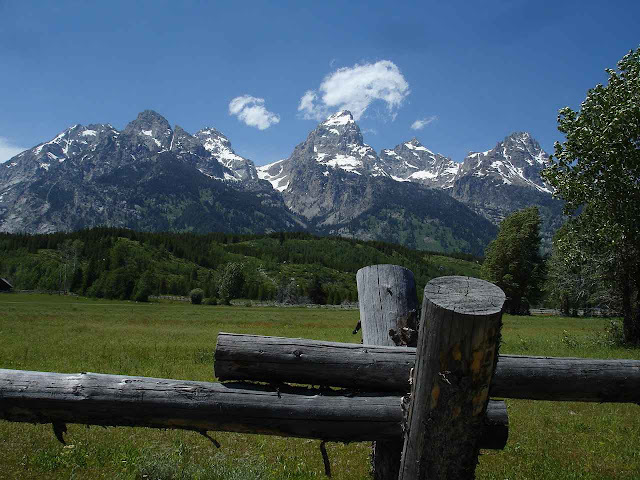 Along the way are some great views of the Teton mountains from different perspectives. 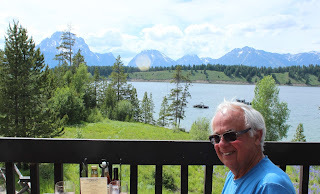 Of course, we could not end the northern stretch of the park without stopping for a meal on the deck of Signal Mountain Lodge looking out at the southern end of Jackson Lake. At this lake it is possible to rent a boat, hike, or many other activities. 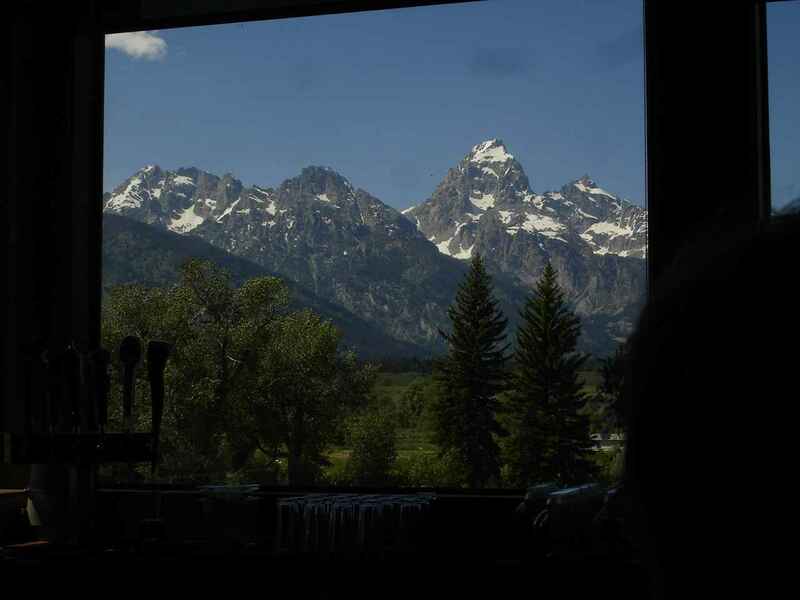 Eustis enjoys the ride back to Gros Ventre with different views of the mountains. It is in the 80's here but still a fair amount of snow on the 14,000 foot mountains. The Tetons are so impressive, partially because there are not the extended foothills you might see in the Sierras. The mountains seem to rise up directly from the valley. 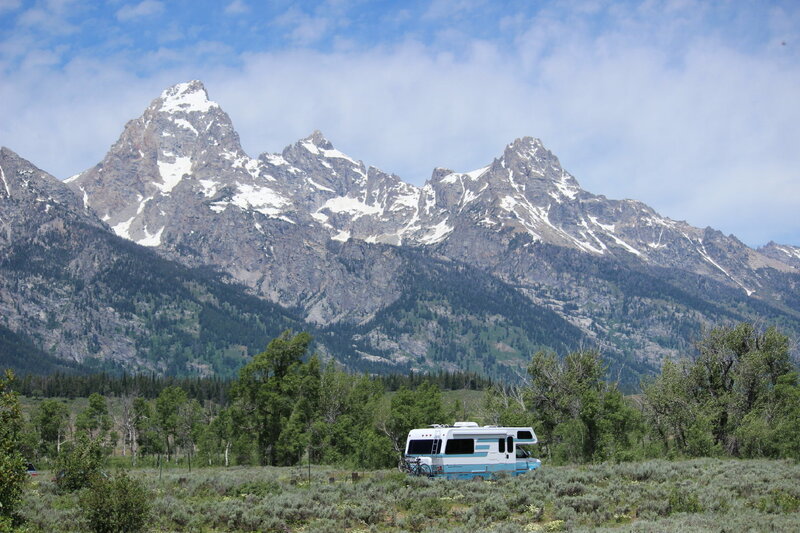 Lady Blue seems to really enjoy her return trip to the Grand Tetons. Who knows, maybe we will be back a third time?